Is this still available on purple vinyl? Faith and Void's split LP. Released in 1982. This 12" LP was recut from the Silver Sonya re-masters in November 2008 at Chicago Mastering Service and comes with a free MP3 download of the album. This split is also available on CD (which also features songs from the Faith "Subject to Change" EP), see #087. 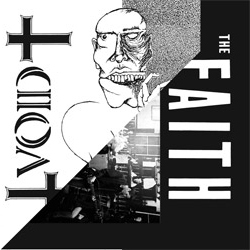 You can also purchase the Void songs and Faith songs separately as MP3 EPs by going to #008a, #008b.